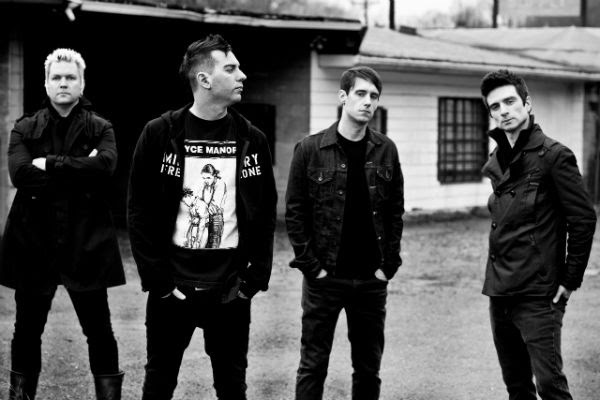 BAND RELEASES LIVE VIDEO FOR "TO HELL WITH BOREDOM"
Anti-Flag have revealed plans for the rest of 2016. The band has booked a handful of shows in the U.S. and will embark on an Australian tour that runs from December 5 through December 11, along with three key dates in Southeast Asia. (See graphic below).About the trek, the band said, "Pittsburgh to Australia isn't an easy commute... when we get there we want it to be special. 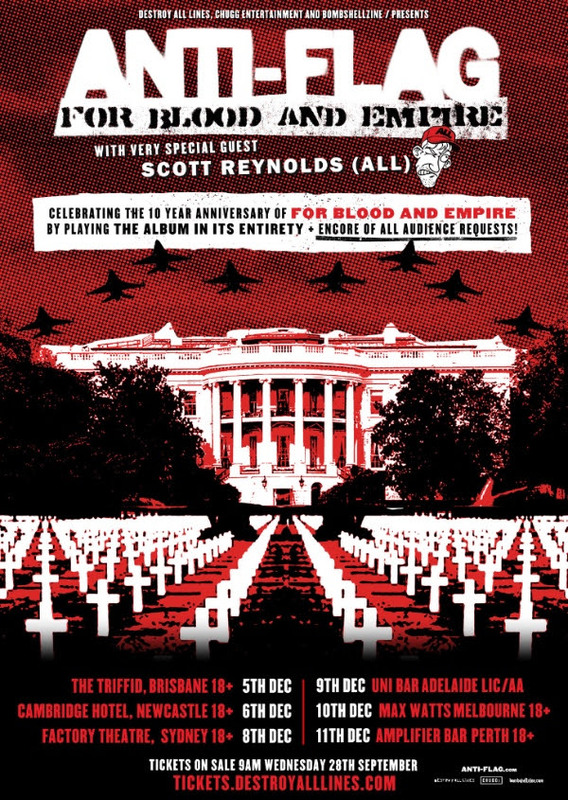 This tour is no different, celebrating 10 years of 'For Blood and Empire,' we will be performing the record and then an encore of all audience requests. It's going to be a unique show to say the least. As always, the emphasis will be on community, solidarity, and empathy. We look forward to sharing this tremendously important record from our band's life with a part of the world that we have found solace and family in for years." The U.S. shows include a November 3 hometown show in Pittsburgh, Pa., at Mr. Smalls Theatre right before Election Day. The band will also play Washington, D.C. on November 30. The shows are part of the Rock Against The TPP tour, organized by Fight for the Future and a coalition of anti-TPP organizations highlighting the disastorous effects of the so called "trade deal" — the Trans-Pacific Partnership. More info on Rock Against The TPP can be found here. The band also said, "The Rock Against The TPP shows that we have played across the U.S. and Canada were so amazing that we had to curate one in our beloved hometown of Pittsburgh, Pennsylvania. Pittsburgh, an international epicenter of the labor movement, a city where union loyalty and the fight for human rights courses through the veins of its citizens to this very day. The Rock Against The TPP shows are beyond educational, they're inspirational. They are a true testament to music's ability to bring people together and create positive change; a rally to energize us all to continue to fight against The TPP and all of the ills it will bring to the world." The band will play its final show of the year at New York City's Irving Plaza on December 17 with Bouncing Souls and Up For Nothing. Additionally, Anti-Flag have just dropped their live, behind-the-scenes video for "To Hell With Boredom" from 2015's American Spring. The clip was directed by Maxim Frolov and was shot while the band was on tour in the Czech Republic this past summer. 11/3 — Mr. Smalls Theatre | Pittsburgh, Pa.
11/30 — TBA | Washington, D.C.
12/17 — Irving Plaza | New York, N.Y.